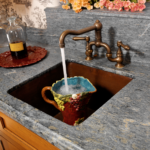 The 708 single-handle pull-out kitchen faucet has a one or three-hole installation option. It contains a multifunction spray head with a 45″ metal hose. The 712 single-handle kitchen faucet is designed with crisp contemporary lines. Not only will it fit into any kitchen or bar decor, but it is a most versatile model featuring a 360 degree spout.